Becoming a CA (Chartered Accountant) is itself a prestigious thing. To reach to this reputed designation one has to keep patience and put hard work immensely. 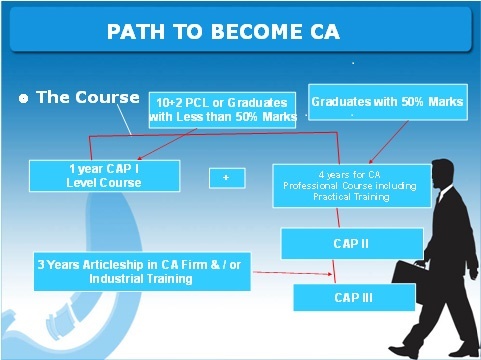 The ICAI (The Institute of Chartered Accountants of India) which was established by an Act of Parliament conducts the professional course of Chartered Accountancy in India. 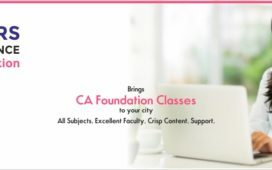 FOUNDATION COURSE-The Foundation course is the entry level examination level ofCA examination course. The Foundation examination is being conducted twice a year in the month of December and June. Eligibility criteria- candidates who have passed their class Xllthexamination may appear. Here there is no need of any percentage criteria. Enrolment- the candidates may enrol themselves till June 30thfor the December attempt andtill December 31stfor the June attempt. You may fill the online registration form from orgby clicking on “Course Registration Forms” in “Students Tab”. Passing criteria- 40% needed in each paper and simultaneously 50% aggregate marks. DIRECT ENTRY ROUTE-The Direct Entry Route allows the candidates to directly appear in the intermediate level. Eligibility criteria- Commerce Graduates/Post Graduates (55%) and other Graduates/ Post- Graduates (60%). Enrolment- the candidates have to register for the intermediate examination course. After enrolling they have to pursue a four weeks integrated course on information technology and soft skills (ICITSS). Once they complete the ICITSS course they may join the articleship for 3 years. The candidates may appear for the intermediate examination once they completed their 9 months of articleship. Intermediate Course– In this level candidates get exposure on core and allied subjects to accounting profession. The appearing candidates have the choice to choose between the Group 1 and Group 2 which to appear first. Eligibility criteria- candidates who have passed CA foundation examination or ICITSS with 9 months training experience are eligible to appear in the intermediate examination. Here there is no need of any percentage criteria. Enrolment- the candidates may enrol themselvesfor the November attempt andMay attempt. You may fill the online registrationform from orgby clicking on “Course Registration Forms” in “Students Tab”. Final Course– In this level candidates get exposure on advanced core allied subjects to accounting profession. The appearing candidates have the choice to choose between the Group 1 and Group 2 which to appear first. Eligibility criteria- candidates who have passed the CA intermediate examination and are left with only six months articleship training are qualified to appear in CA final examination. Enrolment- the candidates may enrol themselvesfor the November attempt andMay attempt. You may fill the online registration form from orgby clicking on “Course Registration Forms” in “Students Tab”.